air joe is proud to serve the Aurora community! We are proud to be a part of this community, serving your heating and air conditioning needs: air joe is listed in many directories under titles such as : Aurora Heating Contractors, Aurora Heating, Aurora Air Conditioning, Heating Repair, Air Conditioning Repair, Aurora Heating and Cooling Contractors, Rooftop HVAC Repair, Ductless AC Systems, Boiler Repair and Aurora Heating and Air Conditioning Contractors. We are here for you whether you need furnace or air conditioner repairs, heating and cooling estimates, equipment replacement or new installation of a furnace, air conditioner, heat pump, rooftop heating and cooling or comfort products to improve the air filtration for your home or business. About Aurora, IL - Happy to be your hometown Heating & Air Conditioning Contractor! The city of Aurora is located in northeastern Illinois in the counties of Dupage, Will, and Kendall. Initially established in 1834 by early pioneer Joseph McCarty, Aurora received incorporation in 1857, earning the nickname “City of Lights” for its distinction as one of the first U.S. cities to implement all-electric citywide street lighting in 1908. Situated just forty miles west of downtown Chicago, Aurora is presently home to more than 200,000 residents, making it the state’s second most populous city. Aurora’s impressive history is reflected through the numerous historical homes and buildings situated throughout the city, many of which are listed on the National Register of Historic Places. The area is home to an impressive collection of architecture that includes structures by Frank Lloyd Wright, George Grant Elmslie, and Ludwig Mies van der Rohe, as well as more than fifty historic Sears Catalog Homes and Lustron all-steel homes. The Stolp Island Historic District contains more than twenty historic structures that include the circa 1931 New York Street Memorial Bridge and circa 1917 Aurora Hotel. 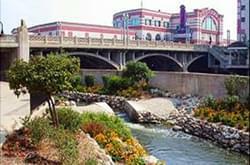 For entertainment and leisure, Aurora offers everything from historic museums and local sporting events to an impressive array of shopping and dining opportunities and the Phillips Park Zoo. Hollywood Casino Aurora, Splash Country Water Park, and the 61-mile Illinois Prairie Path represent just a fraction of the recreation, fun, and entertainment Aurora has to offer. Aurora’s beautiful seasonal weather, remarkable array of amenities, and convenient proximity to the city of Chicago makes it a great city for residents and visitors alike!